WHY IS THE BIKINI KITTY SYSTEM SO GREAT? Make your money back ASAP with our great prices and client friendly retail. We offer free in-spa Point of Sale signs and web links to get the word out about your new spa 'partner', Bikini Kitty! Our 2-step exfoliation kits do the trick. Effective, natural AHA's and BHA's clear the way both on the surface and in the hair follicle... Then the natural bristle body brush lifts and uncurls potential ingrowns. This duo of at home treatments works better and more effective than harsh chemical exfoliator or simple body scrubs. Pros have always recommended that clients exfoliate and hydrate skin pre/post the hair removal process. Now you can be sure your clients get the job done and have the tools and information they need! Get just what you need to fit the needs and seasons of your salon's business. We do offer a Basic Starter order that includes a great mix of easy to move products. 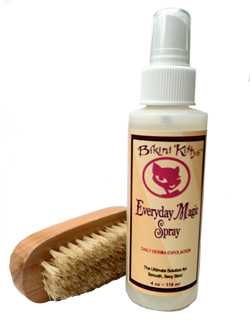 Bikini Kitty is easy to integrate into your regular hair removal treatments. Natural, organic ingredients that truly work are at the heart of what makes Bikini Kitty work. Yet each ingredient was carefully blended to keep things as gentle as possible for delicate and sensitive skin. Our unique, 2-step exfoliation process gets the job done without offending. Clients are becoming more and more aware of ingredients, looking for natural & healthy alternatives. Now you can partner with Bikini Kitty to offer them an effective treatment for the No 1 complaint about hair removal: Ingrowns! We offer as much free information and training as possible to our Spa partners. Online you will find videos and support material for our products. If you are close, we offer in-spa training's as your staff grows and changes. 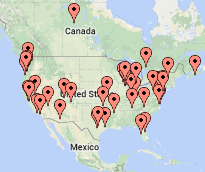 We link to you directly on our retails site with as much booking/info as possible. Our shipping charge has always kept your clients - as your clients - we do NOT wish to under cut your in-spa sales, ever! We are a growing business too and we can appreciate what it takes to turn on the lights every day! Let us know what we can do to make your life, sales, bottom line a little better! Do NOT hesitate to ask. 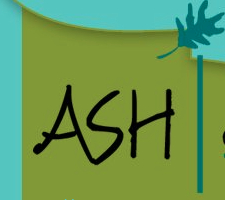 We are always happy to work with you to make things ($$) happen! 2) No-Bump Body Brush Click here for Blog on Dry Body Brush tips. + Easy and complete 'At Home' directions. Home use will give speed and ease to any removal service. Effective enzymatic exfoliation with natural AHA & BHA exfoliation clears skin and pores/follicles. Paired with physical exfoliation. This quick, easy to use daily combination will eliminate and prevent ingrowns, rash and bumps for all of your hair removal clients. This Kit is for Home use Pre & Post system for exfoliation of hair removal areas. With daily use, clients come in to appointments fully and effectively (not OVERLY) exfoliated. Post appointment this kit eliminates ingrowns and keeps regrowth on track. DON'T LOSE A SENSITIVE CLIENT! An Aloe base with healing and soothing Lavender and Tea Tree. Witch Hazel strengthens skin so target areas are less reactive. Calms and reduces swelling post treatment to help block histamine reactions. Disinfectant without alcohol. Skin prep without residue. Anti inflammatory without drugs. Aromatheraphy without synthetic perfumes. Natural, effective, gentle. Makes delicate clients strong! In-Spa Pre treatment = to clean and Post = to sooth. and take the RED OUT! Back Bar sizes available. Home use to treat and strengthen skin for your most sensitive clients. Use in conjunction with Exfoliation Kit above - they can strengthen skin and make their skin less reactive. That little extra push for truly problem areas. Stubborn issues can be spot treated with this deeply effective mix. Glycolic, Rooibs & Willow Bark in equal measure are mixed in with Castor for deep, pore delivery. Topped off with Tea Tree and Lavender oils. 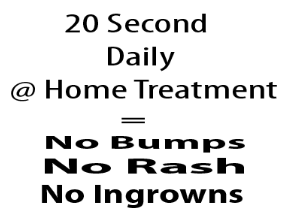 Home use Clients can target issues of ingrowns, acne and bumps/rash with this intensive treatment. 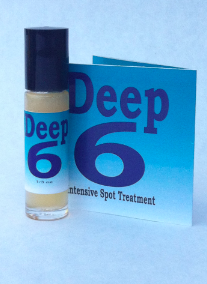 In-Spa Target deep issues of ingrowns in spa = 1 oz Back Bar size available. Bikini Kitty's products have totally exceeded my expectations. 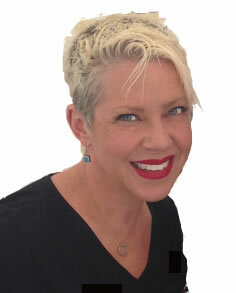 Professionally, I am an Aesthetician, and BKs products are in a class of their own when it comes to the treatment room. 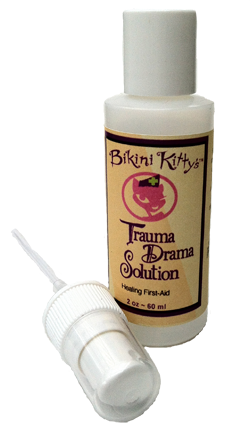 I use the Trauma Drama Solution as a post hair removal treatment and client reactions have been great. Additionally, all of the clients who have bought the ingrown hair kit have come back raving about the results. In my personal life, I am vegan and BK's commitment to keeping their skin care products cruelty free is very important to me. Lastly, as a Biochemistry student, their holistic approach to product formulations have really impressed me. I'm very pleased to use Bikini Kitty's products in the spa and at home.